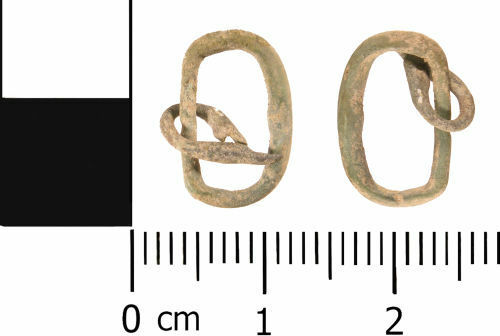 A complete copper alloy single loop buckle frame and pin, of Medieval dating (AD 1250 to AD 1500). The buckle has a sub oval frame, with an expanded outside edge. The strap bar is narrowed. The pin has been made from a triangular piece of sheet copper alloy metal. It has been wrapped around the strap bar. The pin narrows to a blunt point. The buckle measures 13.5 mm in length, 8.6 mm wide and 2.9 mm thick. It weighs 0.5 g.
The buckle is a mid green colour, with an even surface patina. Abrasion, caused by movement whilst within the plough soil, has resulted in a loss of some of the original surface detail.